This week Sudbury Joggers were running in London, Colchester and Haverhill ranging from distances from 5 miles cross country to marathons. What is yellow and blue and involves a lot of running… not Sudbury Joggers, obviously as we’re blue and yellow! This time we’re talking about the Saturn Running’s “Despicable run” where runners are minions for up to 7 hours running up and down the beautiful Thames River in our country’s capital city. 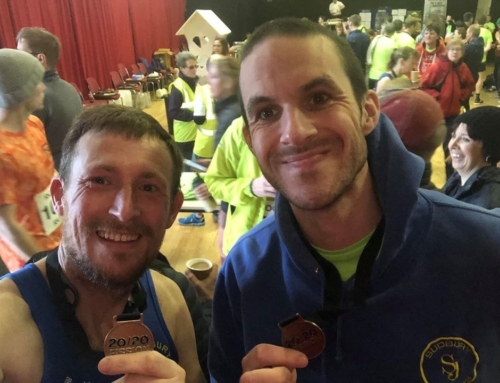 On Saturday, 23rd of March, Sarah Pennock and Clive Davey ran laps of 3.28 mile out and back to run a marathon distance. Clive finished the 8 laps in a time of 3 hours and 49 minutes and Sarah finished in a time of 4 hours and 54 minutes. Sue Crawte posing after the London Landmarks Half Marathon. 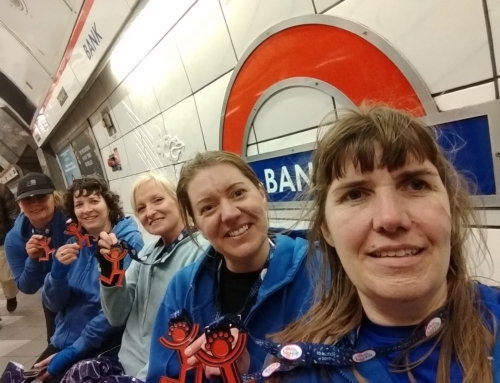 On Sunday, March 24th and still in London, three of our members joined 15,000 runners to run the London Landmarks Half Marathon. Todd Lewis finished first for the club in a time of 1:32:42. Next across the finish line was Anna Whatling in 2:12:10 and Sue Crawte in 2:47:31. Todd Lewis raised £700 at London Landmarks Half Marathon for Guide Dog’s UK. Raising money for Guide Dog’s UK, Todd Lewis raised £700 for running the London Landmarks Half Marathon. Todd stated that he was pretty pleased with his result after a lengthy layoff. 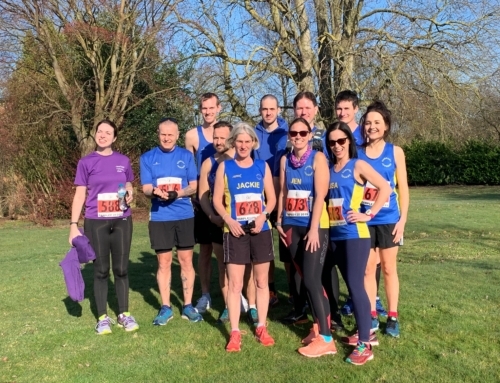 Closer to home, Ruth Cowlin, Cliff Manning, Andy Buck, Wayne Mumford and Jonathan Price teamed up again with Newmarket Joggers to run the final of the Suffolk Winter League Cross Country in Haverhill. The results for the Haverhill Cross Country and the Suffolk Winter League are due out soon. 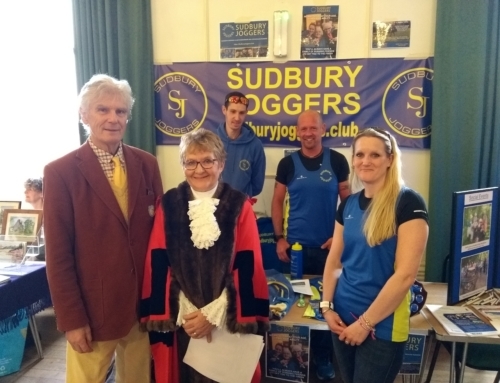 The Colchester Half Marathon is one of the most highly attended races for Sudbury Joggers and this year was no different. This year, 34 members completed the 13.1 miles around Britain’s oldest recorded town and first city and its surrounding villages, in what turned out to be hotter weather than expected, as they ran in the sun and 13°C heat. Adam Mumford, Richard Smith, Jimmy Secker, Sandy Maloy, Benjamin Cuthbert, Charlotte Richardson, Mark Johnston-Wood, Dee St Ledger, Sharon Breward, Steve Roberts, Kathryn Ross-Cuthbert, Steve Jeggo, Claire Rooke, Sally Sandford, Sian Guyton, Emma Richbell and Sarah Jeggo shortly before Colchester Half Marathon. Crossing the finish line first for the club, in 14th place overall, was Kieran Hayles in 1:16:48. Finishing soon after Kieran was Piotr Bulacz (1:23:42), Benjamin Cuthbert (1:27:13), Charles Hann (1:29:02), Richard Smith (1:30:27), Darren Barfield (1:32:58), Ian White (1:35:05), Jason Smith (1:39:03), Lucy Cowlin (1:40:48), Adam Mumford (1:42:34), Jimmy Secker (1:43:47), Mark Johnstonwood (1:44:56), Jacqueline Hann (1:47:35), Lee Parkin (1:51:33), Dee St Ledger (1:52:02), Robert Hunt (1:54:48). Finishing on the two hour mark was Ben Boxall in 2:00:33, and he was followed by Corinne Winch (2:02:18), Sarah Jeggo (2:05:26), Steve Jeggo (2:05:25), Paul Gwynne (2:16:14), Claire Fradley (2:20:22), Sian Guyton (2:20:22), Sally Sandford (2:20:25), Sharon Breward (2:20:55), Kathryn Ross-Cuthbert (2:24:00), Emma Richbell (2:25:52), Jodie Budd (2:26:29), Ann Alexander (2:26:32), Claire Rooke (2:35:07), Sandy Maloy (2:36:07), Charlotte Richardson (2:36:07), Steve Roberts (2:38:27) and Jacquie Webb (2:39:12). Jodie Budd, Ann Alexander, Claire Rooke and Steve Roberts after finishing the Colchester Half Marathon. Jodie Budd managed two different personal bests at Colchester. The first was beating her best half marathon by 4 minutes and the second was beating last year’s Colchester Half Marathon time by 21 minutes. Strangely, Jodie was not the only member of Sudbury Joggers to get a 21-minute personal record against their 2018 Colchester Half Marathon time. Steve Roberts ran his very first half marathon at the 2018 Colchester Half Marathon and finished 21 minutes sooner this year compared to last year.